MINDULLE has been weakening rapidly after landfall. 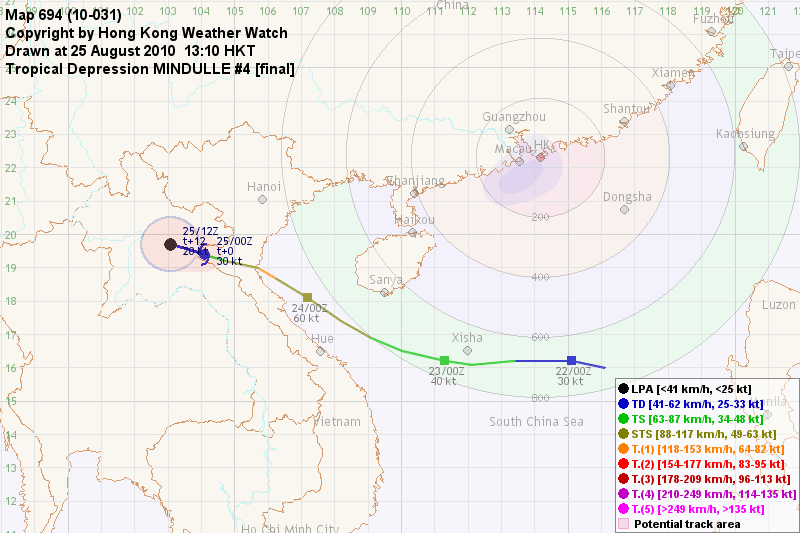 At 08 HKT, MINDULLE was centred about 260 km (140 NM) SW of Hanoi. MINDULLE is the 101st name in the tropical cyclone name list. It was contributed by North Korea, meaning dandelion. This name was last used in 2004. MINDULLE is now situated in the southwestern periphery of the subtropical ridge, and is expected to move WNW. MINDULLE is expected to dissipate very soon. This is the final bulletin on MINDULLE. 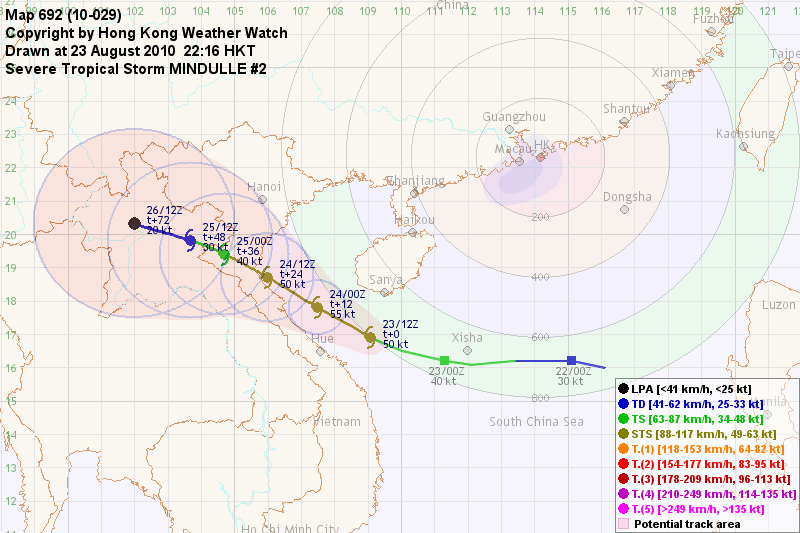 MINDULLE has taken a west-northwesterly track and has intensified early today. It has just made landfall in Vietnam. At 20 HKT, MINDULLE was centred about 230 km (120 NM) S of Hanoi. MINDULLE displayed a banding eye earlier today which prompted its upgrade into a typhoon at 14 HKT, but the eye was quickly filled upon landfall. Without moisture from the sea, MINDULLE is expected to weaken rapidly until dissipation in around 24 to 36 hours' time. 06W has intensified into a severe tropical storm and was named MINDULLE. 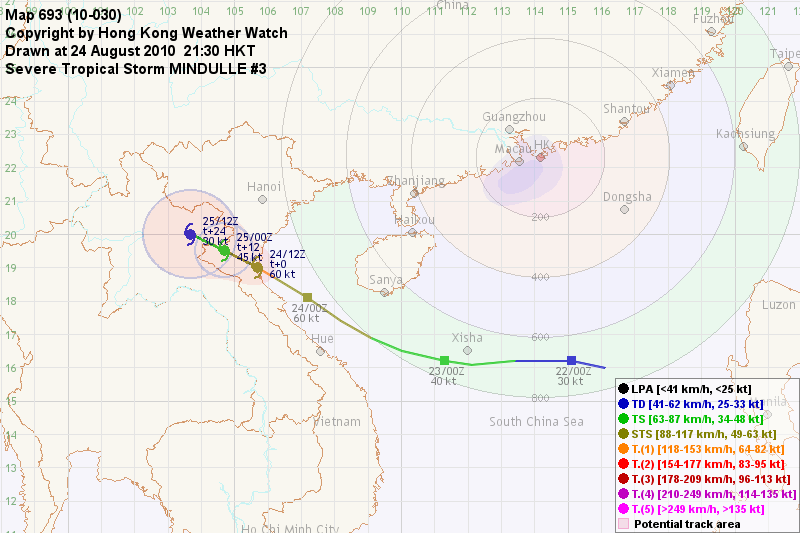 At 20 HKT, MINDULLE was centred about 570 km (310 NM) SE of Hanoi. MINDULLE is now situated in the southwestern periphery of the subtropical ridge, and is expected to move WNW towards northern Vietnam. MINDULLE's spiral structure has become more apparent but convections are still lacking in its northern semicircle. The cyclone should intensify further but will soon start to weaken as it nears Vietnam. Offshore areas may occasionally encounter strong winds tomorrow, and Hong Kong may be affected by heavy rain. After passing Luzon, tropical disturbance 94W intensified into a tropical depression (06W) early today. It went on to strengthen into a tropical storm tonight. 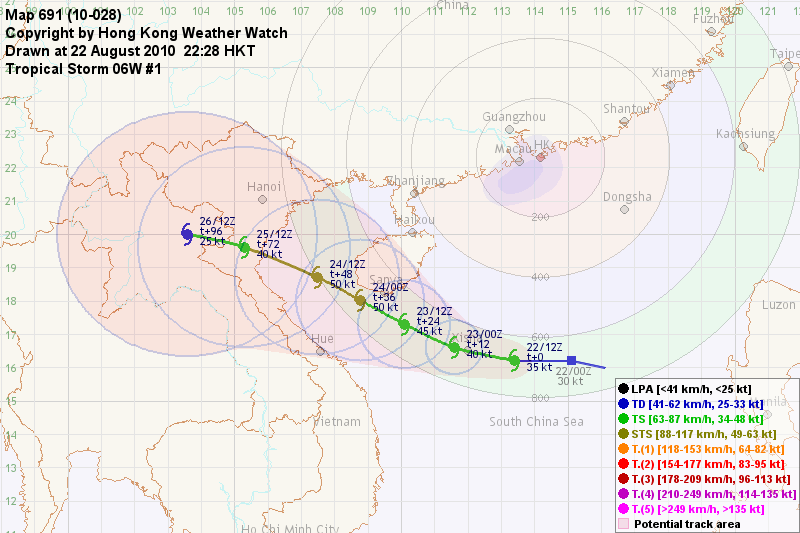 At 20 HKT, 06W was centred about 680 km (370 NM) S of Hong Kong. 06W is located in the southern periphery of the subtropical ridge. A passing trough is expected to weaken the ridge and allow 06W to be situated in the southwestern periphery of the ridge. This will gradually allow a WNW movement and the storm may skirt Hainan on Tuesday. 06W's convections are concentrated in its southern semicircle due to the induced southwest monsoon. 06W should gradually intensify in a rather favourable environment with enough moisture and suitable sea surface temperature. 06W will weaken as it approaches Vietnam due to land interaction. Winds in offshore areas may strengthen in the next two days. Also, as 06W moves to Hong Kong's southwest, it will bring moist air to Hong Kong from the southeast which may lead to heavy rain on Tuesday.